An educated, assertive black woman was a scary thing to some folks then, says Helen Green. “Still is,” she winks. She is an outspoken, vibrant African-American woman, a retired RN administrator, hospital board member, and mental health professional with an MS. She shares her stories with wit, humor and an infectious laugh. She gets emotional talking about opportunities she feels are often wasted by young women today. Helen came from a proud but poor African-American family. Her mother was a rarity in the 1930’s — a college educated black woman who instilled the desire for education in her children. Even so, her own family warned her to “try not to be so smart, because being smart is dangerous.” This did not stop her. She applied for nursing school seven longs years before she was accepted. 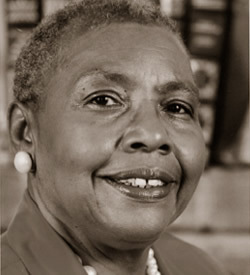 It was this unquenchable spirit that kept her going even when she received many threatening phone calls when she became first black nurse administrator at a major Dallas Hospital.